1. I got a new pillow. It's so comfortable. I think it's the most perfect pillow I've ever owned. It's a Casper pillow that I bought on sale a couple of weeks ago. I'm a little picky about pillows, and this one gets gets five stars from me. 2. Another internet purchase I made recently was a one-month's supply of potassium iodide tablets for myself and my family. If North Korea hits us with a nuke, we'll be ready, as long as we're not dead! I like emergency prepping because it gives me a measure of control and a lot of peace of mind regarding possible events, both natural and man-made, over which I really have no control. 3. There's a new show on PBS that started this week that I like. It's called Victorian Slum House. It's an experimental reality show in which modern-day Brits live like the poorest Londoners did in the Victorian era. Ever since finding out that a lot of my ancestry is British (41%), I've been kind of obsessed with everything England, so I really like the show. I'm sure I have ancestors who lived this way. Better them than me! Sorry ancestors; you know I love you! Thanks for taking one for the team. 4. John went to bed fine on Tuesday night and woke up super sick on Wednesday morning. It turned out to be strep throat. I felt so bad for him. I got strep about two months ago and I had the worst of it on his birthday and while we were getting ready to go on vacation. The timing was awful and I was even more miserable than normal for strep because I still had to pack and get ready to go even though I was exhausted and achy all over and my throat was killing me. It was terrible. When did this become about me, though? I'm happy to report that John recovered more quickly than I did and is back at school again today. Hopefully no one else gets it! 5. 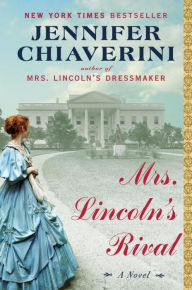 I'm reading a book called Mrs. Lincoln's Rival by Jennifer Chiaverini, an author I like who I've read before, but I'm struggling with this book. I love historical fiction but not when it gets bogged down with too many facts and reads more like non-fiction, and that's what this book has been like so far, with only a light plot to it. I can't read more than a few pages pages at night before getting too tired to read anymore. I contrast this with a mystery thriller that I couldn't put down last week (The Woman in Cabin 10). I checked out two mysteries from the library that I'm eager to read but I won't let myself read them until I finish this book. They're being held as ransom and motivation! I like the cover. That dress! And Mrs. Lincoln's Rival fought back, in its own way! Here's how. Two days ago I read an opinion piece in The Wall Street Journal about how President Trump said that if Andrew Jackson had been president later than he was then the Civil War wouldn't have happened. I understood the author of the piece's arguments in favor of this viewpoint because the book has gone into detail about James Buchanan and what things were like when Abraham Lincoln took office, and so I can totally see what Trump and the author of the piece were saying about the effects of good or bad leadership and how it can change the course of history. I'm sure I once knew this but had forgotten the details until reading them (so many of them!) in this book. So I must admit that the book was very helpful in my understanding of this issue. Well played, Mrs. Lincon's Rival. Way to put me in my place! Hoy es Cinco de Mayo. We're having tacos for dinner and I'm reminded of how much I've let my Spanish go. I will get it back someday, and then I want to learn French! I hope your weekend is full of sunshine and flowers, either literally or figuratively. Ideally both!